These conditions led to the undermining of the existing tribal economies, environmental and economic decline, malnutrition and starvation, internal migration and warfare. Despite these pressures, however, with the exception of warfare, Māori society appeared to have largely recovered by the time Captain James Cook reached New Zealand. Traces of information about how Māori responded to their circumstances exist in oral histories that record both the challenges faced and changes made and an important element in Māori management of the environment and its resources lies in the placement of humans within whakapapa (genealogy). 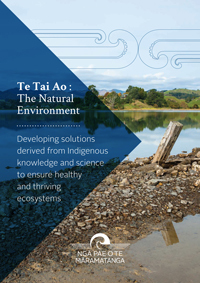 Sustainable environmental management is achieved through people appointed as kaitiaki (guardians of particular resources) who can control resources through allocating, limiting or prohibiting use and the economies of pre-European Māori were sourced from the lands and resources held by the hapū or tangata whenua of an area. By analysing content contained in existing manuscripts on the early colonisation of New Zealand by Māori, the project team will test the ideas and address the question of application of traditional knowledge to modern issues we are facing. Mai i te Mahana ki te Apakura Makariri will review records of existing oral histories to identify Indigenous solutions to global problems and provide outcomes that broaden the scope of theory and practice available to work on current climate change and resource depletion concerns. There is an opportunity for our society to incorporate kaitiakitanga as a stepping stone to bringing all elements of the environment and its resources into our economy. Provide exemplars for how to manage our environments to optimise their productivity. Explore and articulate the potential of societal uptake of kaitiakitanga. Identify Indigenous solutions to global problems providing outcomes that broaden the scope of theory and practice available to work on this ‘wicked’ problem.